It’s with little wonder that Jestina was destined to become a professional makeup artist. She got her start early on by sneaking makeup to school to transform her friends’ and classmates’ faces during her years in middle and high school. 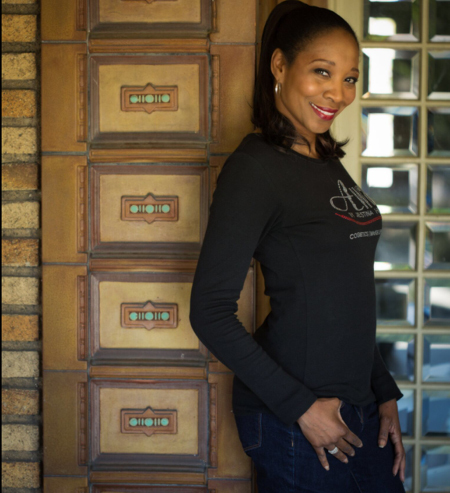 Today, with thirty years of global experience as an expert makeup artist, Jestina Howard is creator and owner of Aware Cosmetics. In her studio, nestled in cozy Mountain Brook, a suburb of Birmingham, AL., Jestina is able to work one-on-one with local clientele to help enhance their everyday looks and to teach them new makeup application techniques. The creation of the Aware Cosmetics product line in 2003 was a natural progression of Jestina’s pursuits, interests and passion for all things makeup and beauty. Through her brand and prod-uct line, Jestina hopes to make clients aware of their of beauty, but not obsessed with it! In addition to makeup and beauty, Jestina is also truly passionate about bringing awareness and attention to lung health and the fight against lung disease. Personally, Jestina has lost both her father and stepfather to lung disease, and her mother currently lives with asthma. As a result of these deeply personal experiences, Jestina gives an annual donation from Aware Cosmetics product sales to the American Lung Association of Alabama, to further its mission of working to save lives by improving lung health and preventing lung disease, through research, education and advocacy. Over the years Jestina has also worked as a freelance makeup artist for major cosmetic com-panies MAC, Bobbi Brown, Lancôme and Elizabeth Arden and is the former beauty editor for Haute Pink and My Scoop online magazines. She serves as a beauty broadcast spokesperson for Proctor and Gamble’s beauty brands such as Cover Girl, Olay, Clairol, Secret and many more and does beauty segments on several local television stations. As a beauty expert, Jestina is qualified and available to provide quotes for beauty stories and do television beauty segments. To enhance the awareness of each person’s natural beauty and to bring awareness to the tire-less work of the American Lung Association. "Birmingham Magazine counts on Jestina as a crucial creative source. Whether it's sharing fashion and makeup trends with us or putting that "just right"? face on our models at photo shoots, I always know that she will come prepared with everything we need- including a special sense of style and professionalism. The bonus is that Jestina is also completely awesome and fun to work with. When she's working on our team, we know even a long day will be enjoyable and that everyone will be beautiful when they get up from her chair."